Boriana strives to be an active agent in the conscious creation of better present and future outcomes. She channels the science of human flourishing, happiness and optimal performance to design tailored solutions for her clients and students. She supports transformation and growth for organizations, established and future leaders. Boriana guides people on a path to happier, more meaningful and fulfilling lives, focusing on and expanding their strengths, love, kindness, compassion, creativity, collaboration. Over the last twelve years she has delivered lectures, programs and retreats in America, Europe and Asia. Topics range from happiness, creativity, leadership and success to mindfulness, character and love. Boriana leads group programs, individual coaching, product development consulting. Clients include teams and leaders from start-ups, non-profits, finance and technology companies, education institutions. 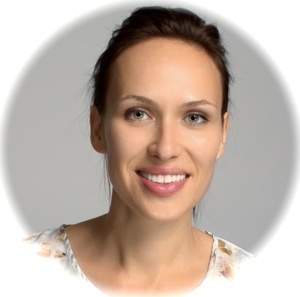 Boriana teaches Leadership and Positive psychology for the Executive MBA program, American University in Bulgaria. She taught for the Certificate in Positive psychology program at The Wholebeing Institute. Boriana is Director at Large on the board of the American University in Bulgaria Alumni Association, assisting with stakeholder strategy and communication during a period of revival and restructuring for the university. She is on the core team of Thrive Now Boston, an organization dedicated to creating happiness experiences for the community. Boriana presented her methods and practices at the Fourth World Congress on Positive Psychology (2015), Vitality: International Virtual Emotional Intelligence Conference (2015), Embodied Positive Psychology Summit on Love (2017), First Positive Education Summit in Bulgaria (2018). She has written blog articles, hosted TV and podcast series on the science of happiness and workplace satisfaction. Boriana studied psychology at Harvard University Extension School (2008-2011), then got her Certificate in Positive Psychology from Wholebeing Institute (2012-2013). Specialized in Teaching for Transformation (2014-2015) and Positive Psychology Coaching (2013), both Wholebeing Institute. Earlier, earned BA in Journalism-Mass communication and International relations from the American University in Bulgaria (1997-2000); Linguistics and English, Plovdiv University, Bulgaria (1994-1996). Boriana is a member of the International Positive Psychology Association and the Institute of Coaching affiliated with Harvard Medical School. Boriana continues to learn from world-renowned researchers, professors and leaders in the field. Also an accomplished artist, Boriana is passionate about creating art that moves and inspires. She has completed a yoga teacher training (2011) and uses the wisdom of this practice in her work and life. Love, creativity and perspective are some of her signature character strengths.